In a medium saucepan, bring 2 1/4 cups of water to a boil. Add the rice and a generous pinch of salt. Stir once, cover and simmer over low heat until the water is absorbed and the rice is tender, about 20 minutes. Remove from the heat and let steam, covered, for 20 minutes. 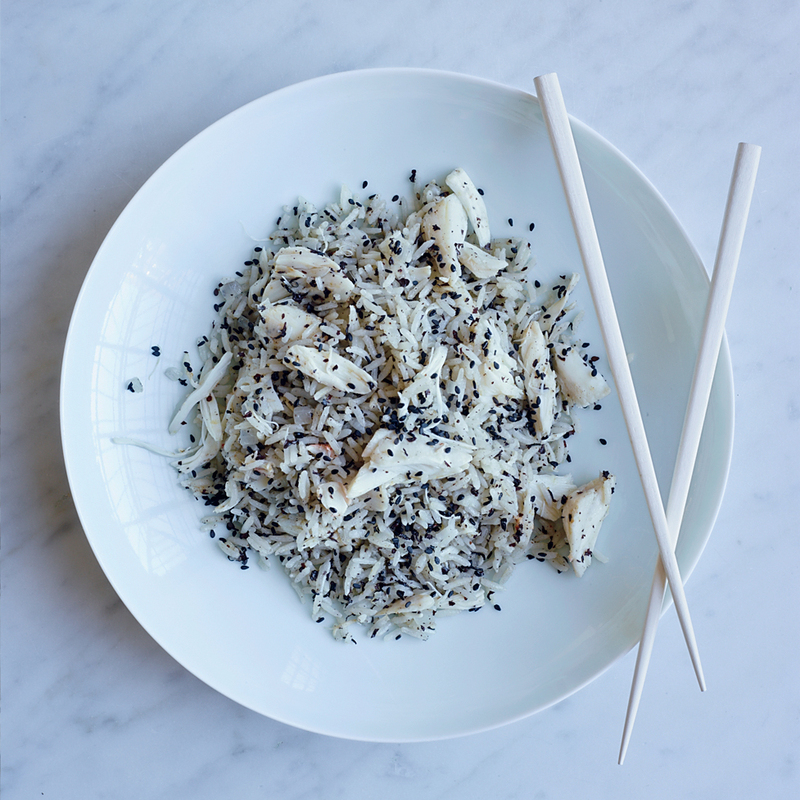 Fluff the rice with a fork and spread it out on a plate to cool slightly. Meanwhile, in a large skillet, toast the tea over moderately low heat, stirring, until fragrant, about 1 minute. Transfer the tea to a plate and let cool, then finely crumble with your fingers. In the skillet, melt the butter. Add the onion and cook over moderately low heat, stirring occasionally, until very soft but not browned, about 12 minutes; season with salt. Add the rice and tea and cook over moderate heat, stirring gently, until the rice is hot and the tea is evenly distributed, about 2 minutes. Gently fold in the crabmeat and cook until warmed through, about 2 minutes. Season generously with pepper. Transfer to a platter and garnish with sesame seeds. Serve right away. The cooked rice can be refrigerated overnight. Let come to room temperature before using.